Keeping your house in order and your budget in line can be difficult. One of my goals is to limit the time I spend in some areas of my life to free up time for other things I might be interested in. And one of those areas where I try to limit my time spent as much as possible is in the kitchen. Matt and I both have busy days and evenings with full work schedules, school, and additional jobs. While we are nowhere near as busy as our friends with little ones, we find it difficult to make time to cook at home. Some weeks, when I am feeling inclined toward cooking, I may spend an entire evening making a meal that will last us the rest of the week. But during other weeks I have found my schedule too busy to do more than pick up a few ingredients on the way home from work to throw dinner together at the last minute. Then one day I discovered the pre-cooked chicken at Costco. For just $4.99, you can get an exceptionally large pre-cooked chicken at Costco (assuming you are willing to brave the parking lot and the exit line). With the dinner entree already complete, all that is needed is a side dish or two to complete the meal. 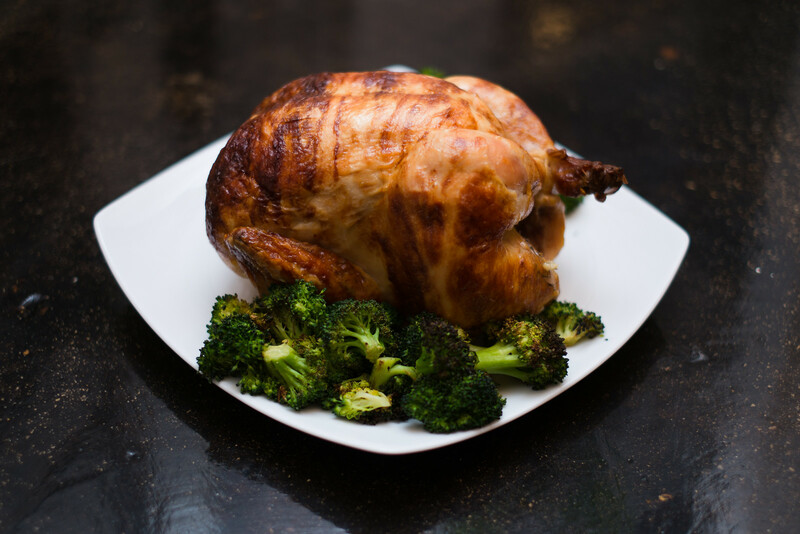 One of my favorite sides for roasted chicken is oven roasted broccoli. Over the course of the past year we have perfected a recipe for oven roasted broccoli, which I love because it is easy and fast to make and, amazingly, Matt actually really likes it (despite his dislike of broccoli in general). The broccoli can completed in less than 20 minutes, including prep and cook time – and you can clean the dishes while it cooks. It is a surprisingly tasty side dish that I now consider a staple. 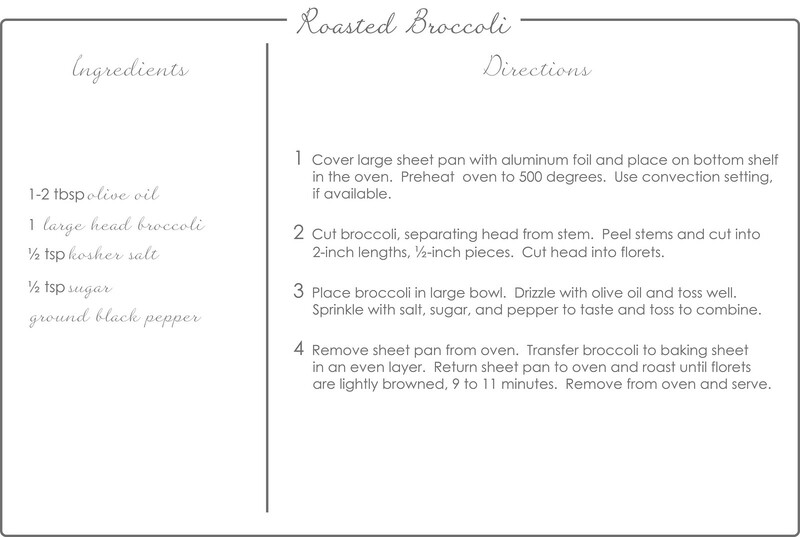 The secret with the oven roasted broccoli is to pre-heat the sheet pan in the oven while you are prepping the broccoli. You want the sheet pan good and hot, so the broccoli starts to sear when it hits the pan. 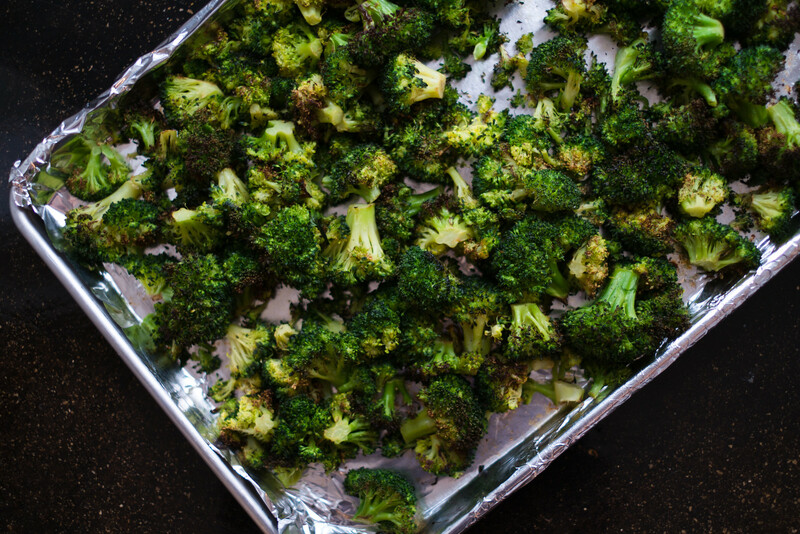 If you have a convection oven, use it to roast the broccoli a little faster and give it a little crunch. You want the florets to brown a little, but be careful not to overdo them. The sugar is essential to help with the browning process and it adds really great flavor. If you want to make this dish really quickly, I have found it easiest to buy a bag of pre-cut florets at Costco and cook the bag in two batches. I put two pans into the oven and mix half of the bag with all the ingredients in the recipe card below (half a bag is at least one full head of broccoli, if not more). I will put that half in the oven and start prepping the other half. I try to rotate the pans half way through. 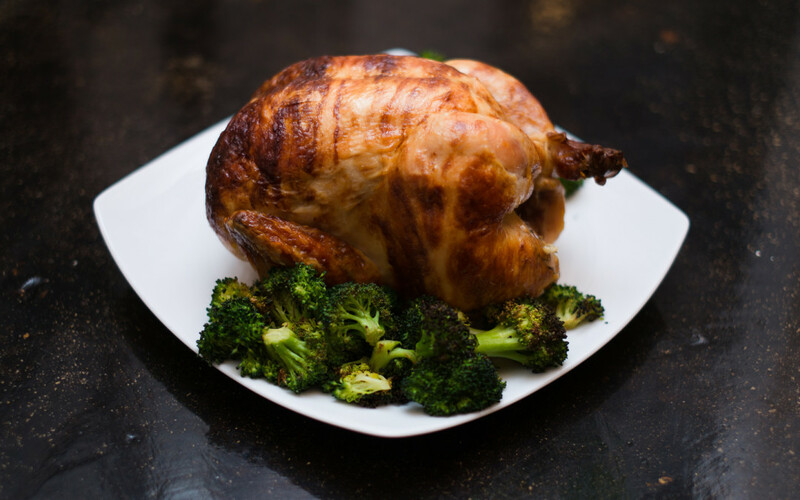 I have found that one full chicken and a huge bag of broccoli from Costco can last us about three to four meals, and the total cost is just $5 for the chicken and $4.50 for the broccoli. You can get these ingredients at your local supermarket as well (although they may cost a bit more). You can add other sides to this as well. Microwavable sweet potatoes are a great options as well as microwaveable rice. The goal with this meal is to have a healthy meal on the table for very little time and money. This meal is by far the cheapest and fastest meal I can throw together and it is an excellent option for weeks when I just cannot bring myself to spend a full evening in the kitchen. So now when I have to drop by Costco on my way home, I grab a pre-cooked chicken and a huge bag of raw broccoli florets, and I have the making of a pretty good dinner.